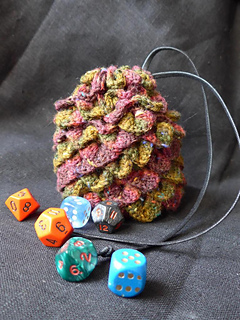 This little dice bag looks like a dragon egg complete with dragon scales. The bag will hold as many dice as you want as you can adjust the size easily. You can also use any yarn you have lying around with a matching hook size. The pattern consists of written instructions (US and UK terminology) for making the bag and guidelines about how you make the bag as big or small as you want. The bag is worked in the round and no seaming is involved. Gauge doesn’t matter as the size of the dice bag can easily be adjusted while making it. I used dk yarn (75 m/82 yd) and a 5.0 mm (H) hook to make a bag with a diameter of 3”/8 cm and a height of 4”/10 cm. This is my first published pattern. Feel free to contact me if you have any questions or find any mistakes. Feel free to sell the dice bags you make, but please don’t sell the pattern or claim it as your own.